Cactus, or Cacti for plural, (Cactaceae family) receive credit as the world’s largest family of succulent plants. Most of the 2000 known types of cactus species get classified as New World plants. They grow in North, Central and South America. The vast majority of cacti, but not all, are well adapted to desert conditions, using their stems to store water during extended dry seasons. Cacti are also flowering plants that serve an important role in their ecosystem by providing food and shelter to many animals, birds and reptiles. Desert tortoises, for example, often snack on their local cactus stems and fruits. The concept of garden cactus picks up on this theme. 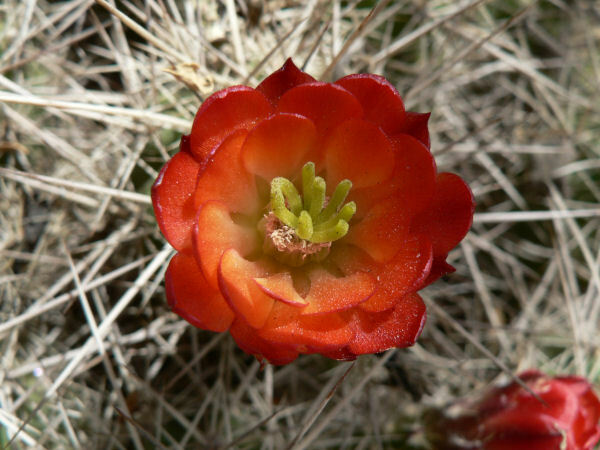 While cactus usually get associated with warm, arid or desert climates, many gardeners already know that more than a handful of cactus species are suitable for gardens in most North American places with at least a USDA Growing Zone of 4, including many prickly pear species, claret cup cactus and pincushion cactus. In colder domains, a warm, sunny garden corner, protected from most of the natural elements, makes for the perfect cactus habitat. 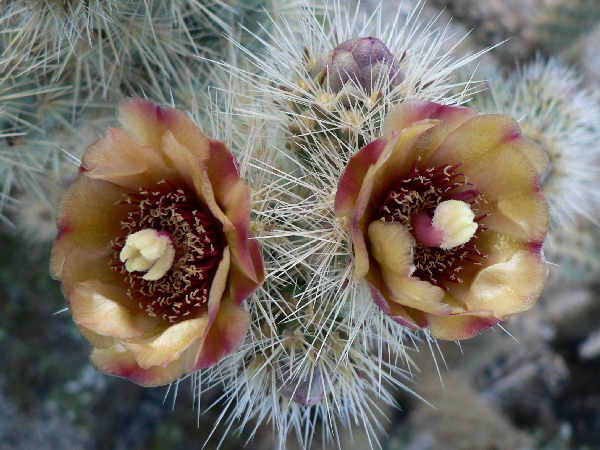 This picture review provides information covering five popular garden cacti genera. Barrel cactus refers to of cacti in two different genera, Echinocactus and Ferocactus. They share the physical trait of a resembling a spiny covered barrel shaped plant. Most barrel species grow between 4-10 feet in height. 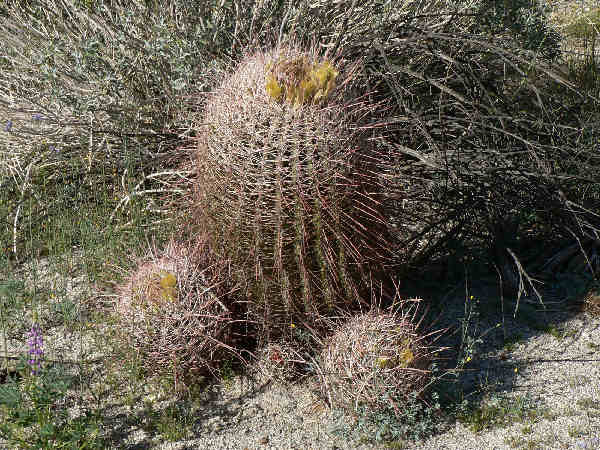 Often they stand singularly in place on the desert floor, although as shown in the picture, some grow in small clusters. 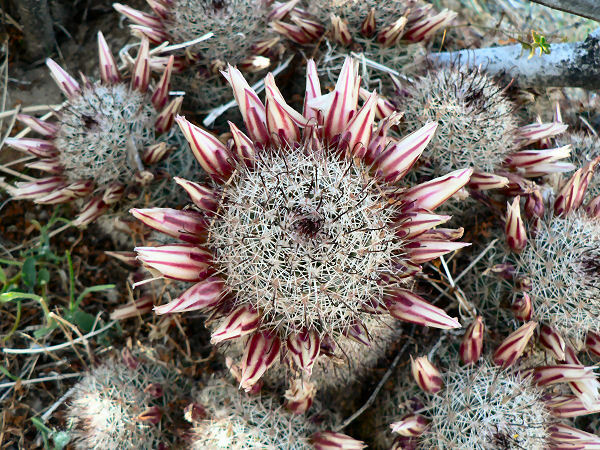 All barrel cacti flower on the top of the plant in a circular configuration. Flowers range in color from yellow to red. Larger plants normally translates into their needing warmer climates. Barrel Cacti grow best in gardens with a USDA Growing Zone of 7 or higher. Retail outlets often sell container cactus, some of which might be transplantable to the garden. In northern climates, gardeners might need to check the cold hardiness of any plant. Human attraction to cacti rivals that of wildlife. They are big business in America, selling as ornamental plants for homes and gardens as well as selling in a variety of consumer products from jam to cosmetics. Trade in cacti has also greatly expanded in the past couple of decades. The Convention on International Trade in Endangered Species (CITES) lists over one hundred cacti species in Appendix I, meaning trade is prohibited. 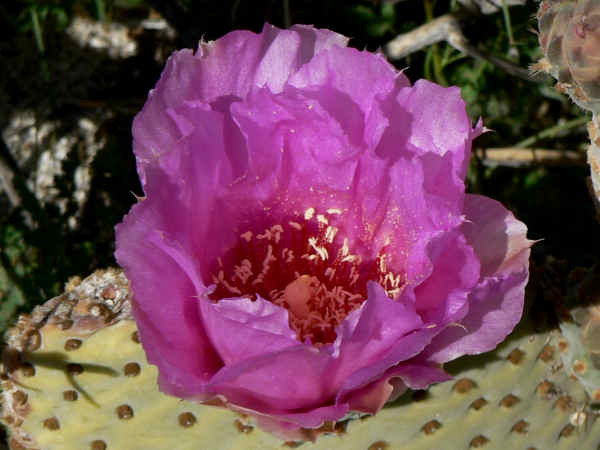 Prickly pear cactus, genus Opuntia, rank as most common genus of native North American cacti. Approximately two dozen species have been identified, ranging in size from one to six feet in height. Depending on the species, spines might cover their flat pads (leaves). While most species adapt to the dry, desert Southwest climates, some prickly pear species extend their range across multiple climate zones. The U.S. Forest Service, for example, lists thirty five separate states that host the Eastern Prickly Pear Cactus (Opuntia humifusa). 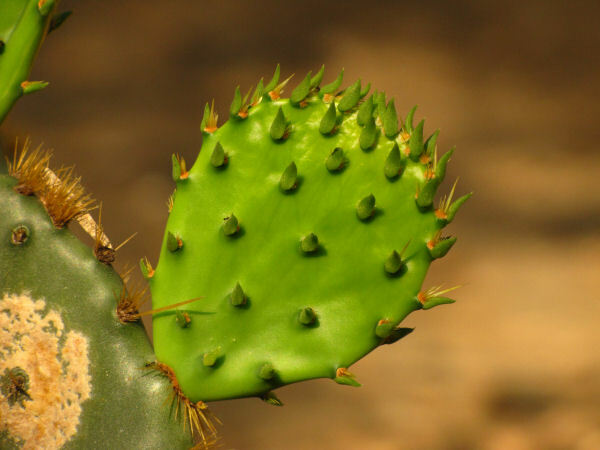 Apart from sharing the common physical trait of flat leaves, differences among Opuntia species make them rather easily identified. Their pads and spines also tend to show characteristic coloring based on species type. 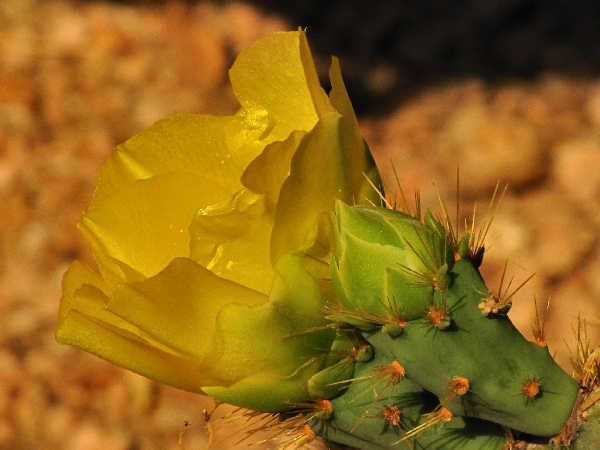 The top picture shows a Prickly Pear yellow flower. The Beavertail cactus (Opuntia basilaris), grows between one and two feet tall. 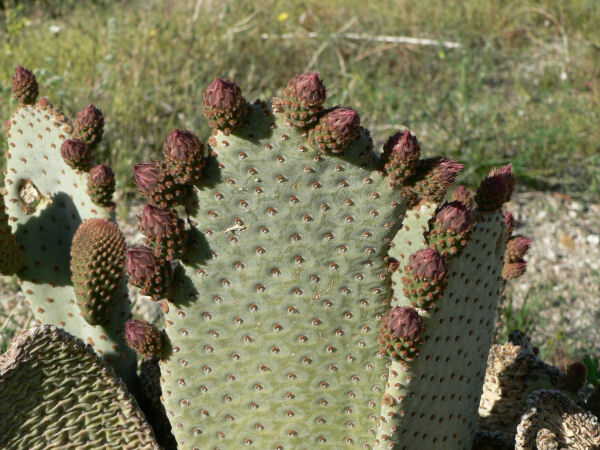 Unlike other prickly pear cactus species, it lacks spines on the pads. Absent the spines, it produces glochids, or small sharp hair-like features, as a defense mechanism. They can stick as sharply as any spine. Beavertail cacti grow at different altitudes, in the sandy soils of the desert Southwest and produce beautiful pink blooms in the spring. Pincushion cactus refers to many species, especially those in the Coryphantha genus. The picture highlights their small round stature, making them ideal garden cactus. Their ability to adapt to a variety of habitats, USDA Growing Zone of 4 or greater areas, makes them a gardener favorite. Experts point to the Echinocereus genus, hedgehog cactus, as a great cold weather garden cactus. The multiple varieties of hedgehog cactus species translates into the potential for a garden with colorful hedgehog flower blooms. Most gardens in the USDA Growing Zone of 4 or greater are suitable for growing Hedgehogs. Approximately thirty species of Hedgehog cactus, Echinocereus genus, grow in the western states. Many species grow a foot or less in height, and grow in clusters of short cylindrical stems. Their brilliant color flowers, make them very popular plants for native gardens. The beautiful red, cup shaped flower of the Claret Cup Cactus (Echinocereus triglochidiatus) tells the story behind the plant name. Gardeners and landscapers sing its praises, using it as a hummingbird plant, with reports of hummingbird species, such as the Broad-tailed, Black-chinned hummingbird and Magnificent, seen feeding on it. 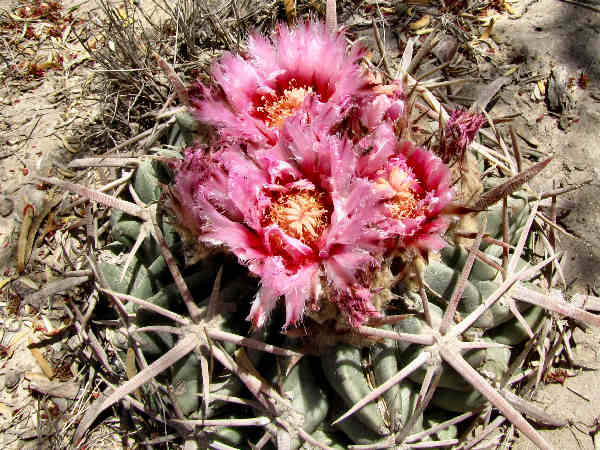 Cholla refers to about thirty cacti species in the genus Cylindropuntia that grow throughout the desert Southwest from Texas west to California. Best recognized by their relatively thin, round stems or branches, flower color differs from species to species. Cholla make excellent landscaping plants. Resident birds such as Cactus Wrens often nest in the branches of taller species. Cactus family diversity means that species height can range between a few inches to sixty feet in height. Homeowners with an inclination to set down long term roots in desert settings often choose some of the larger cacti for landscaping and edging. In desert terms, they can be local trees that need little water or other attention. 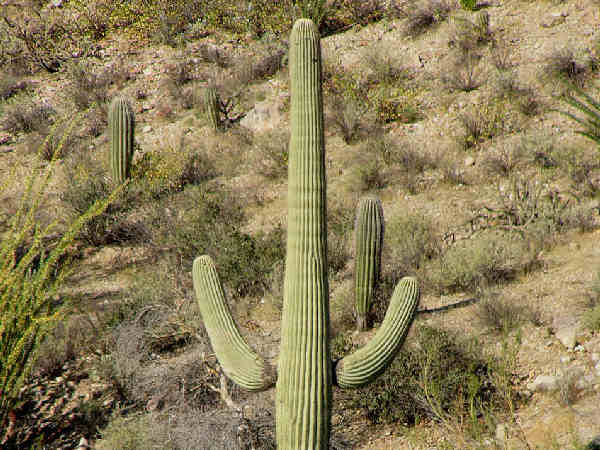 The following three cactus fit the large cactus category. Growing up to sixty feet tall, the Saguaro (Carnegiea gigantea) ranks as the largest cactus in the United States, and a must see for Sonora Desert visitors. Well known for its human appearance, the branches often grow out looking like waving arms atop a mature stem. Gila woodpeckers and other cavity nesting birds commonly call Saguaro cacti home. Organ pipe cactus (Stenocereus thurberi), large ribbed cactus, often grow in clusters that resemble organ pipes. Like the Saguaro, Organ pipes thrive in the Sonoran Desert region of northern Mexico and Southern Arizona, home to the Organ Pipe Cactus National Monument. They are night bloomers and the flowers get pollinated by bats. Landscapers enjoy them because their multiple flowers bloom on the cactus’s multiple buds, with flowering season extending from May through July. Organ Pipe fruit provides food for local wildlife as well as humans, who enjoy making jelly out of it. The scientific name for the Totem Pole cactus, schottii f. monstrosus, pretty much gives away the fact that it is characterized by height. A large, mostly spineless columnar cactus native to the Baja, grows easily in a nursery, making it a popular Southern landscaping plant. The flowers are not as showy as the organ pipe flowers. Nonetheless, it makes for a very nice border and/or edging plant.